A new Israeli land-grab in Bethlehem! With President Obama now at a safe distance, the takeover of Palestinian lands continues as before. It is tragic to think that only four years ago in Cairo Obama had spoken of Palestinian statelessness as ‘intolerable’. On this visit he spoke only of settlement construction being ‘unconstructive’. Clearly the US is not going to stand in the way of Netanyahu’s program of annexation and ethnic cleansing. How ironic for Bethlehem’s Christians that a new ‘via dolorosa’ should appear during Easter week. A military order has been issued by Israeli authorities in the occupied West Bank for the illegal confiscation of Palestinian lands and orchards, leaving dozens of families without their main source of livelihood and without the ability to build homes. A military order has been issued by Israeli authorities in the occupied West Bank for the illegal confiscation of Palestinian lands in the Khirbit Ed-Deer area, west of Nahhalin village, in the Bethlehem District, in order to build 70 units for Jewish settlers and public buildings, the Palestine News Network (PNN) had reported. PNN quoted the deputy head of the Nahhalin village council Jamal Najajra stating that the lands in question are dozens of Dunams, located near the Beit Illit illegal settlement which is built on lands that belong to the residents of Husan, Nahhalin and Wad Fokeen, and are planted with olive trees. Najajra added that Israel intends to build 70 units for Jewish settlers in addition to a number of public buildings. He said that the new planned constructions are meant to connect the Beit Illit settlement with the Gavot settlement by illegally confiscating Palestinians orchards, leaving dozens of families without their main source of livelihood and without the ability to build homes. Najajra added that the village council has contacted attorney Ghayyath Nasser so that the necessary appeals in Israeli courts can be filed. Najajra also said that this is not the first time Israel has decided to annex Palestinian lands in the area. Israel previously confiscated lands in the Al-Jamjoum area, the Salem Valley, and Ein Fares where Israel dumps waste-water coming from the Beitar Illit settlement, PNN reports. Tags: bethlehem, israel, israeli settlements, livelihood, Palestinian, palestinian statehood, settlements, two-state solution. Filed under Uncategorized by Father Dave on Mar 28th, 2013. Comment. This is an insightful article by Huffinton Posts’ Robert Naiman. One can put a positive spin on Obama’s visit and speeches. While he didn’t promise to do anything to help the ‘peace process’ along, he didn’t seem to want to hinder it either – something that the Israeli government has relied on the US to do through successive administrations! Indeed Obama would be doing the world a great service if he allowed some of Israel’s Arab and international neighbors to take a more intentional role in solving the Israel/Palestine debacle, and we all know that he has no personal desire to prop up Benjamin Netanyahu! There’s a half-empty way and a half-full way of looking at President Obama’s Jerusalem speech about the creation of an independent Palestinian state in the West Bank, Gaza, and East Jerusalem. Don’t look at me. Just because the United States is the principal military, diplomatic, and economic protector of the Israeli government, doesn’t mean that I, as the president of the United States, will do anything about the military occupation of millions of Palestinian human beings. Bibi doesn’t want an independent Palestinian state, Bibi’s government doesn’t want an independent Palestinian state, AIPAC doesn’t want an independent Palestinian state, and Congress — which defers to AIPAC — doesn’t want an independent Palestinian state. Of course, many of them mouth the words — not Bibi’s government, they don’t even do that — but those who mouth the words oppose any practical measure that would help bring an independent Palestinian state into existence. They’re “two state fakers.” Settlement freeze? Impossible. UN membership for Palestine? Can’t be done. No, according to the two state fakers, the only option on the menu in the restaurant for the Palestinians is to return to negotiations without a settlement freeze, negotiations that for 20 years have brought more land confiscation, more settlements, more restrictions on Palestinian movement and commerce, more oppression. And so, Obama was saying, my hands are tied. Don’t look at me. The half-full way of looking at it is this: it was a great speech. If you “price in,” as the markets say, acceptance that the U.S. government isn’t going to lead on this, it was a great motivational speech. President Obama made a very compelling case that someone else should do something. The interesting thing is that whether you see it as a great motivational speech or a white flag of surrender, the practical consequences for the public are largely the same: the initiative for justice is going to have to come from somewhere else. The best that we can probably expect from Obama is that if the initiative for justice comes from somewhere else, he won’t get in the way, or won’t get in the way very much. While that is much less than we are entitled to expect, it is much more than the Netanyahu government and its supporters want. They demand that President Obama do everything he can to get in the way of justice. So, if he doesn’t get in the way of justice, or only does so halfheartedly, he’ll be helping us more than they want. Some people look to Europe. If Europe got serious about curtailing imports from Israel if the occupation doesn’t end, that’s something the Israeli business elite would take seriously, and they would put pressure on the Israeli government to compromise, rather than lose their export income. It’s striking to contrast how Europe is treating its trade with Israel to how it is treating its trade with Iran. In the case of Israel, Europe is toying with the idea of seriously curtailing imports from illegal Israeli settlements in the West Bank. In the case of Iran, Europe has shut down virtually all trade, including trade in lifesaving medicines, in violation of international humanitarian law. Giving Israel a little more of the Iran treatment could go a long way. In addition, Europe could support membership for Palestine at the International Criminal Court, and then could support legal action against the settlements and land confiscation at the ICC. So, Europe certainly has a lot of room to get serious about ending the occupation. Some people look to the Arab Spring. Since 1979, the Camp David Treaty as implemented has been a pillar of the occupation. As many Egyptians see it, it wasn’t supposed to be like that. Under the treaty, the Israeli military was supposed to withdraw from the West Bank. But of course, that never happened. What happened instead is that for 30 years the Mubarak regime traded compliance with Israeli policy towards the Palestinians for U.S. agreement to look the other way while the Egyptian government beat the Egyptian people. Now Egypt has a democratically-elected government. What if that government made ending the occupation a political and diplomatic priority? Tags: AIPAC, article, barack obama, Iran, israel, Obama Israel Trip, occupation, palestine, Palestinian, palestinian territories, United States. Filed under Israel and Palestine, israel and palestine conflict by Father Dave on Mar 26th, 2013. Comment. Obama pleasing no one in his visit to Israel/Palestine! It seems that the American President, in his attempt to please everybody in Israel/Palestine, is pleasing no one. Israelis remain unconvinced that the weakened US military will be able to provide any real support should there be a real outbreak of hostilities with Iran. The Palestinians remain unconvinced that Obama is willing to apply any leverage to see a ‘two-state solution’ come into being. Many Palestinian lives and much political capital could have been saved over the last four years if President Obama had shown the determination to facilitate two-state solution negotiations. Now, rather than calling for the resumption of a meaningless ‘peace process,’ we Palestinians expect real action on the ground. Unfortunately, after that landmark speech, President Obama appeared to give up on his goal. This meant going back to business as usual: Putting pressure on an occupied people and rewarding the occupying power. In the past four years, Israel has added almost 50,000 settlers to the Occupied State of Palestine, almost 3000 attacks have been conducted by settler terrorists and over 1000 Palestinians have been killed. We could have saved lives and political capital if President Obama had shown the determination to create the right environment for meaningful decisions leading to a two-state solution.Four years ago, Mr. Obama was elected President of the United States of America. He won the hearts of Palestinians and other peoples of the world with his principled positions, vision and courage. Later on, he stood up in Cairo and gave us hope. His moral convictions showed us that he understood our quest for freedom, justice and peace. His strong statements, especially his request that Israel cease all settlement activity, gave us hope that the U.S. could help us to achieve these ideals in reality. Both Palestinians and Israelis who believe in a two-state solution saw President Obama as a real opportunity for change. We have tried every possible venue to get closer to peace, but we have been always met with Israeli intransigence and a lack of commitment to implement its obligations. It’s been Israel’s unilateral actions, mainly settlement construction and the imposition of an apartheid regime, that have undermined the entire goal of the peace process to a point that leave very few people optimistic. Israeli unilateralism turned the peace process into a smoke-screen to cover its systematic policy of colonization. Today, in the Occupied State of Palestine, we have homes that are being demolished and families evicted by an occupying power at the same time that the number of settlers went up almost three times since the beginning of the peace process, with a total of over half a million settlers today. What has allowed Israel to get away with its severe violations? It is an unprecedented culture of impunity that keeps treating Israel as a state beyond the law. But it is also the fact that rather than peace, Israel’s goal is to increase colonization as much as possible. The two-state solution is not part of the agenda of Israel’s government and that’s a primary reason why negotiations failed. When last year we went to the United Nations we aimed to revive hope. This courageous and rightful step meant, for Palestine, a reaffirmation of our rights in a non-violent manner. Recognition of the State of Palestine on the 1967 border meant also to create a positive initiative to open a meaningful political horizon by salvaging the internationally endorsed two-state solution. We felt that after twenty years of Israeli violations to every single agreement, it was time for the international community to participate in the resolution of the conflict, whilst aiming to respect and honor the inalienable rights of the Palestinian people. It is in this spirit that we have committed as well to respect all our obligations, international treaties and international law in general. But instead of welcoming this step, Israel led an unprecedented campaign of colonization with over 11,500 settlement units approved within a very few months following the UN vote. This act isn’t only a war crime, but it is also in open defiance of the stated U.S. policy regarding Israeli settlements. Acts like this, including approving hundreds of settlement units during Vice President Joe Biden’s visit, are Israeli messages to the U.S. and the rest of the world that it is not interested in peace: So far, Mr. Netanyahu has been able to get away with it. Unfortunately, President Obama is not able to visit Palestine for more than a few hours. On March 21st, he will meet with President Abbas. He will be respectfully welcomed by our President and our people. We understand that he wants to listen, read and see for himself. It would have been a great opportunity for President Obama to visit more of Palestine and see the current reality twenty years after the beginning of the peace process. Starting by the fact that we would have love to welcome him at Orient House, the closed PLO headquarters in Occupied East Jerusalem. He would also see segregated roads, just one example of one of the worst combinations possible: Apartheid under a belligerent occupation. Next week marks the beginning of Holy Week for millions of Christians around the world. In Palestine, the oldest Christian community will be separated from their spiritual heart, Jerusalem, by Israeli checkpoints, walls and fences aimed at consolidating the illegal annexation of Occupied East Jerusalem. President Obama is welcome to see this reality and understand that the window of opportunity is closing. We don’t need another twenty years of negotiations to change this reality. We need tough and courageous decisions before it is too late. Racial segregation, including those enforced on public transportation, was a dark period in U.S. history. This is happening today in Palestine, a symptom of how severe the current situation is. Rather than calling for resumption of a meaningless “peace process,” we expect real action on the ground. Such action should lead to ending the Israeli government’s impunity as well as to take the political steps needed. The future of millions of Palestinians and Israelis as well as the rest of the peoples of the region as a whole depends on the U.S. administration’s will to push for justice and peace. For decades Palestinians have been waiting for a miracle. Maybe President Obama’s visit to the Holy Land can provide us with one. Maybe the bells of the Church of the Nativity in Bethlehem will ring once he visits this Friday announcing clear goals and actions to bring an end to decades of occupation, segregation and colonization. This is the road to justice, security and peace. Dr. Nabeel Shaath is the Fatah Foreign Relations Commissioner and former Palestinian foreign minister. He was a member of the Madrid Peace Delegation and later was involved in negotiations with Israel that led to the signing of the Oslo Agreements. From 1993-1995, he served as the head of the Palestinian negotiation team, participating in the talks at Camp David (2000) and Taba (2001). He has also represented Palestine at the World Economic Forum. Tags: hostilities, israel, israel and palestine conflict, obama, palestine, Palestinian, president obama, two-state solution. Filed under Israel and Palestine, israel and palestine conflict by Father Dave on Mar 22nd, 2013. Comment. Hopes are running high world-wide that the new Pope will bring sweeping changes both within the church and to the church’s relationship with other religious and political bodies. At such a critical juncture for the future of Palestine, the leaders of both Fatah and Hamas in Palestine will be keen to establish a positive relationship with the new Pontiff. Francis’ predecessor, Benedict XVI, was somewhat of a failure when it came to Palestinian rights. While the Vatican was always supportive of Palestinian statehood, Pope Benedict made an unfortunate statement in 2006 about the history of Islamic violence that put a lot of Muslims offside. Moreover, being German and growing up in the Nazi era, Benedict was constantly on the back foot with regards to Israel. Hopefully the new Pope will bring in a new era, but we must not count our chickens before they hatch. It is worth remembering that it is not the Pope but the Curia who control the church, and the Curia has not changed (not yet, at any rate). What concerns people the most is the political direction that the leader of the world’s more than 1 billion Catholics will take on issues such as women’s rights, relations with other faiths and foreign policy.Electing the leader of the world’s Catholic faithful is always an unpredictable affair. The choice of Argentina’s cardinal, now Pope Francis, has lived up to the mystery. Palestinians and peoples of the Middle East have been searching hard in the new pontiff’s history to try and figure out where he will stand on the issues that are of concern to them. Two issues were prominently talked about in this regard. The Jesuit background of the new pope was quickly picked up as a sign that the new leader of the Catholic Church will pay attention to socio-economic issues and not just theological ones. In the Middle East, Jesuits are known to have established schools of higher education and other projects supporting the poor. His coming from a non-European country (apparently the first time in a millennium) also ensures, many believe, a more internationalization of the Vatican. The Palestinian leader who congratulated the new Pope was naturally quick to invite the Holy Father to visit the birthplace of Christianity. The congratulatory cable to the Vatican included an invitation to the pontiff to visit Bethlehem. Pope Benedict, as well as Pope John Paul, had visited the Holy Land, including an important visit to the Palestinian city of Bethlehem. The Vatican has generally been supportive of Palestinian rights and the need to end the occupation of Palestine. But equally the leaders of the Catholic Church have placed tremendous efforts to improve relations with Israel and also with world Jewry. A recent agreement between the Vatican and Israel was signed that resolved a number of issues regarding Catholic holy sites in Jerusalem and the status of priests in Jerusalem and the area. Some felt that Vatican gave too much to the Israelis, especially allowing them control over the Last Supper room. The compromise in which the Vatican will retain a symbolic seat on the table was seen as too much of a compromise to an occupying power that took sovereignty by military control. The Vatican’s auxiliary bishop in Jerusalem, William Shomali, a Palestinian, told the National — an English language newspaper based in Abu Dhabi — that he hoped the new leader would continue with the church’s policy of addressing the difficulties facing Christians in the region, especially in countries such as Iraq, where many have been forced to flee because of sectarian fighting. But perhaps the most important issue of interest in the region is the possibility and potential of Catholic/Christian relations with Muslims. Pope Benedict caused a rift in relations with a statement in 2006 in which he quoted an anti-Muslim thinker’s statement on Islam. The head of Islam’s leading higher educational institute, Al-Azhar, was quick to welcome the new Pope Francis and has called for change. “We are hoping for better relations with the Vatican after the election of the new pope,” said Mahmud Azab, an adviser to Ahmed al-Tayyeb, grand imam of Al-Azhar. Arab Christians, while dwindling in numbers, are still an important influential group on Arab nationalism and intellectualism. Christians in areas such as Lebanon, Iraq and Palestine will be looking closely as to what the Catholic Church under Pope Francis will say and do in order to stem the migration epidemic and to encourage remaining Christians to stay in their countries. Palestinian Christian leaders have been insisting that the emigration problem is turning holy sites and churches into dead rather than living stones. The need to encourage and empower this dwindling group is much bigger than their percentages in society. Daoud Kuttab is a contributing writer for Al-Monitor‘s Palestine Pulse. A Palestinian journalist and media activist, he is a former Ferris Professor of journalism at Princeton University and is currently the director general of Community Media Network, a not-for-profit organization dedicated to advancing independent media in the Arab region. Active in media-freedom efforts in the Middle East, Kuttab is a columnist for The Jordan Times, The Jerusalem Post and The Daily Star in Lebanon, and has co-produced a number of award-winning documentaries and children’s television programs. Tags: church, israel and palestine conflict, palestine, Palestinian, palestinian christians, palestinian rights, pope benedict. Filed under Uncategorized by Father Dave on Mar 18th, 2013. Comment. I am encouraged by this article, not only because it lucidly rebuffs the equating of Palestinian activism with Antisemitism but also because it appeared on a University website (in Connecticut, USA). It is important that these discussions take place on University campuses, and it is important that free speech be given full reign in these contexts. Students must be encouraged to pursue the truth about Israel/Palestine without being pilloried as racists for doing so! The screams of an Israeli Air Force fighter jet ricochet through the barren lands of Gaza, as the sounds of explosions reverberate off the bones of 11 Palestinian children and women, who were charred to death during the air strike. Almost 50 miles away in Tel Aviv, the Israeli military stated the target was a terrorist militant group in Gaza. This was reported by the Huffington Post. These air strikes were another part of the Israeli deterrence policy to create extreme preventive punishment and make any attack or retaliation too costly. U.S. media coverage of the Israeli attack on Gaza portrayed the war as an “endless conflict between two foreign entities” and claimed that Israel is justifiably “defending itself,” according to The Guardian. One can only condemn the violence, as it is never the answer to any issue. Nonetheless, western media has focused so much attention on Israel, and has ignored the Palestinian perspective on the apartheid system in the contested territory, that Americans have associated Palestinians as a terrorists and Palestinian support with anti-Semitism. But, is someone really anti-Jewish if you criticize Israel? To answer such a question, one would need to discuss the issue with a follower of the Jewish religion. Stanley Heller is a semi-retired schoolteacher, and he is also a Jew. Heller, like most people, has no tolerance for Anti-Semitism. It “is a hideous crime; it’s a stupid blind hatred,” Heller said. As Executive Director of the 30-year-old Middle East Crisis Committee, Heller also is a firm supporter in equality and human rights for all. In Israel, there is “an ever-deepening apartheid. … Palestinians are being driven away from their homes. In addition, there is aggressiveness against any type of resistance, violent and non-violent,” Heller said. 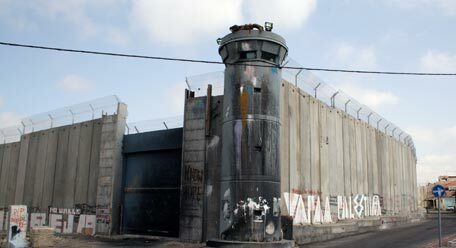 Palestinians are now confined to walled ghettos. In Gaza, they’re subjected to a blockade of essential basic necessities, and are facing economic sanctions placed by Israel. Heller, however, is not the only Jew advocating for basic human rights for Palestinians. There are many Jewish groups pushing for Palestinian human rights such as Jewish Voice for Peace, Orthodox Jews United Against Zionism, Rabbis for Human Rights, etc. The vidence supporting human right violations against Israel is overwhelming; nonetheless there has been limited coverage over the worsening human rights conditions that Palestinians face. The state of Israel has laws dictating the segregation of Palestinians from Israelis pertaining to where they can work, where they can live, to what bus they can get on. Similar laws were created in the post-Civil War era in the U.S. to ensure the denomination of African Americans. The Civil Rights movement is justifiably the story of our greatest American heroes, those who stood up for equality and justice. But when Palestinians try to stand up for the same goals, they are labeled as troublemakers, terrorists, and racists. So to the question, “is someone really Anti-Jewish if he or she criticizes Israel?” The answer is clearly no. Tags: air strikes, Anti-Semitism, antisemitism, article, father dave, Palestinian, truth. Filed under israel and palestine articles, israel and palestine religious conflict by Father Dave on Mar 17th, 2013. Comment.